Loren Connors & Bill Orcutt. Recorded August 30, 2012 at Georgia. Video by Brian Close & Justin Tripp. Zachary Cale, Mighty Moon & Ethan Schmid. Recorded April 17 - 18 2012. Recorded February 22 - 23 2012. 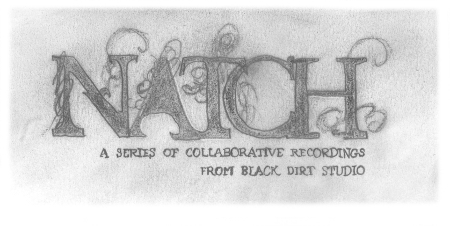 NATCH is a series of collaborative recordings from Black Dirt Studio. Music comes naturally. Give a kid a drum and stick, sit 'em at a piano, tether 'em to a Flying V jacked into a half stack and listen to the sparks fly. The series serves a few different goals - one, to bring musicians together in a recording enviroment without the usual hangups which can weasel their way into a proper album session. NATCH sessions are open format - the artists are free to approach the time in any way they'd like, from improvisation to cover songs to instant composition to sound enviroments to original prewritten material to a simple exploration of the process. The second goal of the series is to tie together the threads of the current broad musical landscape into a more coherent web illustrating how close so much music is in its purest intent. The landing spots of so many disperate artists can be much closer than they may seem from afar. These sessions hope to zoom in the scope of many a listener without the perscribed box and bow of a commercial release. The third and most important goal is to have fun, make some music, and let others enjoy it! The first session took place in January of 2012 and the plan is for the series to be ongoing. Initially artists who had previously been through the studio doors were the first to be invited but the list of forthcoming contributors has grown beyond that stable. NATCH 0 is the prquel to the series, a document of a session from 2007 booked by Dave Nuss (NNCK, Sabbath Assembly) featuring him, Rahdunes, Stellar Om Source and Aswara. NATCH 1 is the first session from the series featuring the Black Twig Pickers and Steve Gunn. NATCH 2 features Dave Shuford (D Charles Speer, NNCK, Rhyton), Margot Bianca (Flown) and Pigeons. These are the preview videos that preceeded the posting of the first three Natch audio sessions. The music is exclusive to the videos and not included in the session playlists.